CHECK OUT OUR MEDIA ATTENTION! On May 4th, Rick Reilly's book, "Sports From Hell" came out and we are chapter 12. Check it out. For the first time in my life, I am proud to say my wife and I are living in a house with a yard. We are very excited about this, so it quite naturally followed that we "have some people over" for the Fourth of July. This seemed like an excellent idea, until, in preparing for the entertainment of the guests. I made the gruesome discovery that not only have Jarts been outlawed, but in fact have been illegal since 1988! Jarts, if you are unaware, are giant lawn darts that you toss underhand in hopes to make them land in a ring. The game is a cross between horseshoes and darts. According to the United States Consumer Product Safety Commission, however, lawn darts are lethal, and have been responsible for the deaths of at least 3 children. The CPSC further estimates that between 1978 and 1987, Hospital Emergency Rooms treated 6,700 lawn dart related injuries, three-fourths of which were sustained by children. Ken Giles, spokesperson for the CPSC, told me that for about 20 years, lawn darts were required to be sold as Sporting Goods. The strategy, however, didnt work. "Young children, were talking seven, eight, nine, ten years old are playing with these and getting injured or killed. Despite the effort to label these as sporting goods and not toys it wasnt working, and we had no other alternative but to ban it." Giles said that while there have been no deaths since the ban, a boy in Elkhart Indiana suffered a severe brain injury last summer, prompting the CPSC to release reminders that lawn darts are banned for everyone. And if you are caught using lawn darts? "There are civil penalties and potential criminal penalties," Giles said. 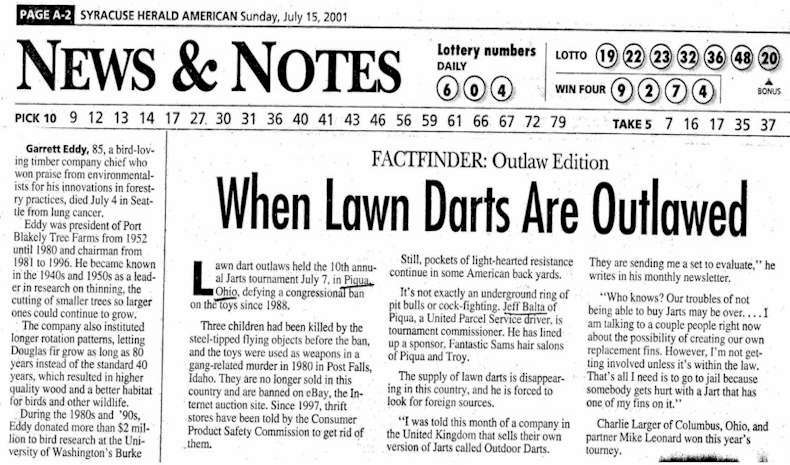 Thats bad news for a small group of non-strenuous lawn game outlaws in Northern Ohio, who have held a Fourth of July Jarts Tournament for the past seven years. About fifty people are participating in this years tournament. "Ive never felt like an outlaw," said tournament participant Shane Davis. "We dont tell where the tournament is held because we dont want to attract any trouble. But we dont feel were breaking the law at all." Davis comes from a long line of Jart players, including his parents and grandparents. The future of the tournament, however, may be in jeopardy somewhere down the road. "Every year a Jart or two breaks. It breaks your heart since they are so hard to get.," Davis said. Getting Jarts these days, in fact, is something of a fringe-of-society black market. Davis says they show up in garages sales and moving sales on occasion. Giles also said the Jart trade is taking place in second-hand stores and garages sales, but that the CPSC is endeavoring to inform people that they need to destroy the darts, not sell them. Giles said he is unaware of any complaints about the ban, though Davis said he is getting 5 to 10 e-mails a day from people looking for Jarts. "If one of your Jarts gets cracked, you better get some duct tape on it right away. If you keep playing with it, the fins will break off," Davis said. Davis said there has never been an injury on the annual Jarts Tournament, but that he can see potential dangers for children using them unsupervised. "Obviously, I wish the ban didnt exist...I believe theyre dangerous, but no more dangerous than, say, fireworks." Our own Fourth of July gatherings remains uncertain. Giles has pointed out that there are safety- enhanced lawn darts available which feature a rounded tip that cannot pierce the skull, which may be an option. Others have suggested that I investigate alternatives such as horseshoes or Bocci Ball. But the fact of the matter is this: now that I know that lawn darts have been banned, now that I am intimately familiar with the issue, I want some. I want to wield them in the face of government authority, and laugh defiantly at a Judge while I quote statistics about children and handgun-related injuries and deaths, ask embarrassing rhetorical questions about parental supervisions and deliver an eloquent discourse on the very nature of civil disobedience and the Constitutional right to bear Jarts. I am an American, you see. Independent, strong-willed and occasionally obstinate. If I want to celebrate my nations birthday by flinging potentially lethal lawn darts at a small ring, then by George Washington, no one, not even the government of the United States, better get in my way. Especially if I have a Jart or two in hand.